I’m sure it’s happened to everyone at some point; I even remember it happening to me as a child. I was playing around with my mom and suddenly, her wedding ring scratched my little face. I know I’ve done it to my girls and I feel completely awful when it happens. Rings can hurt, I have scratched myself plenty of times as well. After my oldest started to complain about me “scratching her”, I started leaving my rings off during the da y. But my hand felt naked, I love wearing my rings. But I hated that my poor daughter didn’t want me wearing them. I’ve heard about silicone rings for men who worked dangerous jobs like firefighters, mechanics, welders, etc. and how they were comfortable and safe. But I didn’t just want a single silicone band, I wanted something a little more girly and fashionable. I saw Enso Rings on Facebook and immediately went to their website. I fell in love with their stackable silicone rings for women. I reached out to the company and they were kind enough to send a set of 3 stackable rings to review. I wear size 7 rings so I ordered the black, white and plum rings in a size 7 and they fit perfectly. They are true to size, so be sure to order your norma l ring size. As soon as I put them on, I knew they were exactly what I wanted. They’re so comfortable, I hardly notice they’re on my finger. I love the option to wear one, two or all three at one time and that I can order different colors to be able to coordinate the rings with my clothes. They’re available in several colors: white, black, turquoise, plum and peach, and you can customize sets of 2, 3, 4 or 5 with whatever colors you’d like. The rings are also available in a women’s size 4 up to a size 9. They’re also perfect for summer, as you don’t have to worry about wearing them in the pool or to the beach. They would be ideal on vacation, as well, so you don’t have to worry about expensive rings getting lost and great to wear to the gym, since they’re comfortable unlike traditional metal rings. I think they’d be good for those who work in the healthcare field, too! If your kids are like mine, they’ll be happy you got a “softer” ring so you don’t scratch them anymore, as my daughter says. Enso also offers s ilicone bands for men and women in several colors and two collections: Infinity and Ultralite. Bundles are available in both collections, as well as the stack-ables. I love my new stack-able rings from Enso! The peach and turquoise rings are on my list so I can switch up my look! I give them 5 out of 5 stars, as they are exactly what I was looking for! Unique and different from just the silicone band, but also fashionable. Free U.S. shipping on all silicone rings! Don’t forget to check out Enso Rings on Instagram, Twitter and on Facebook! If you’re anything like me, you love products that help make your life easier and add to something you enjoy doing. Essie’s Gel•Setter does both for me. I love having my nails painted and I love being the one to paint them. Who am I kidding, I would love to be able to afford a shellac manicure every other week but we just don’t have the money and I don’t have the time to get away even if we did. If we ever win the lottery, I would definitely make sure I get a weekly manicure, that’s a promise! 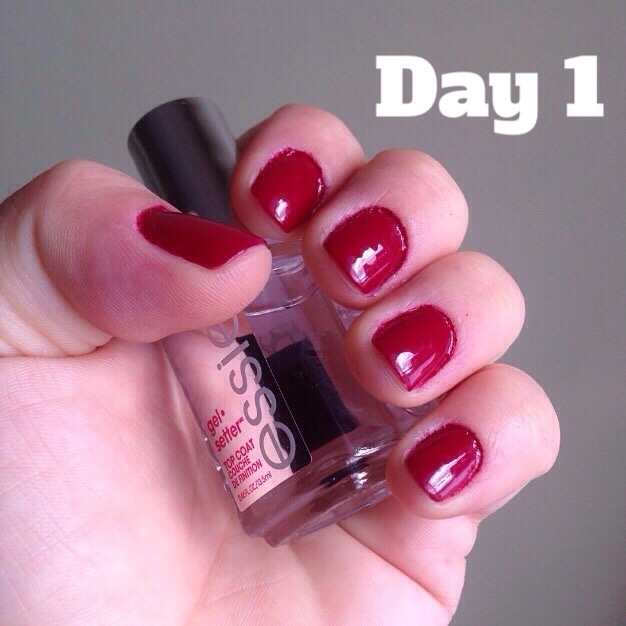 But because I’m my own manicurist, I love finding products that make the process easier and quicker. My husband (thanks to my hinting) got me Essie’s Gel•Setter top coat for Christmas and I was really surprised he found it (he says without helpfrom anyone at the store!). I have used it several times and I don’t think I will ever use another top coat. It goes on so smooth with no bubbles and so much shine! I’ve used a lot of different top coats in hopes of finding one that I really love but never managed to find until Essie’s Gel•Setter. I need my nail polish to stay on through all dishes I wash, the baths I give my toddler, showers (that I rarely get) and not to mention all of the hand washing and amount of Purell I use during the winter. Although it doesn’t say it’s a rapid dry top coat, it actuall dries really fast which is absolutely necessary with a toddler running around. 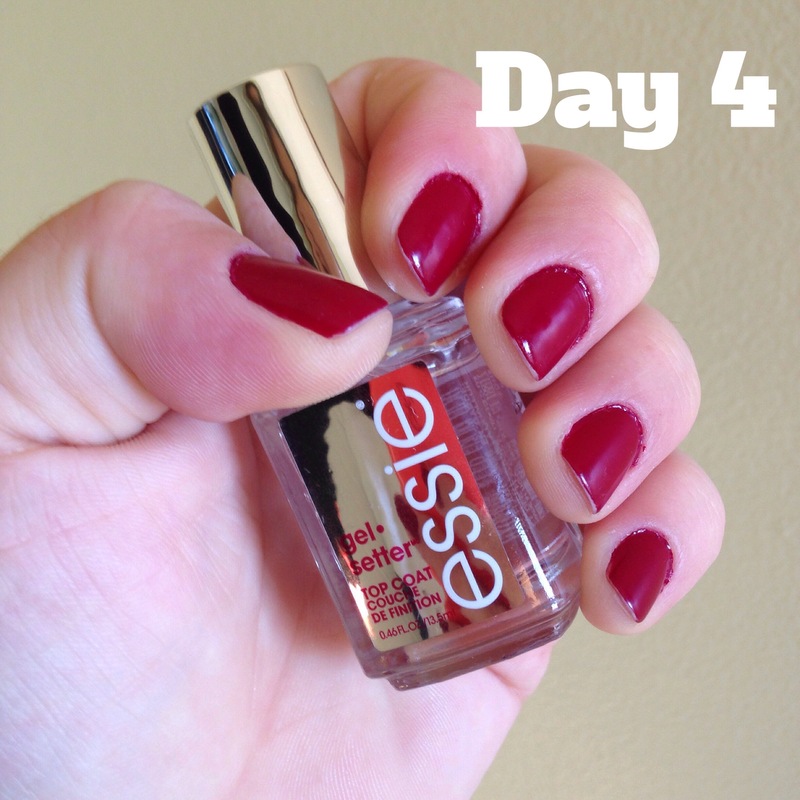 They look fabulous even on day 4! I forgot to take a picture before taking the color off on day 7-8. 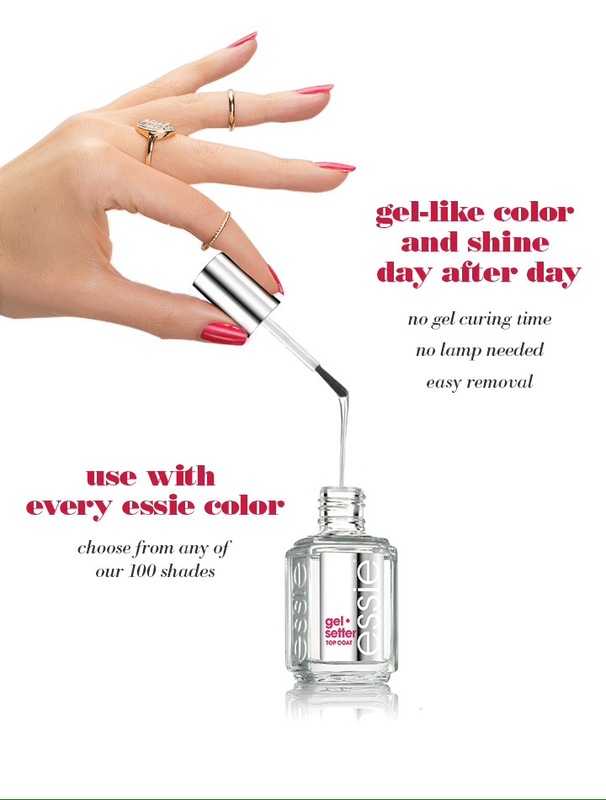 PS – you can use any brand of nail polish color, not just Essie brand!